I recently dined here on a warm Sunday night. The front of the restaurant was open so there was plenty of fresh air. And because we had reservations, we didn’t have to wait, but it was definitely pretty busy and popular around 8pm. We started out with a few appetizers on this particular night. The spicy tuna was delicious with a noticeably spicy kick to it, well balanced by the warm yuca it sat on top of (Spoiler: this was the best dish of the night). The beet salad was a bit salty because of the added salt, but it was not overdressed by any means. 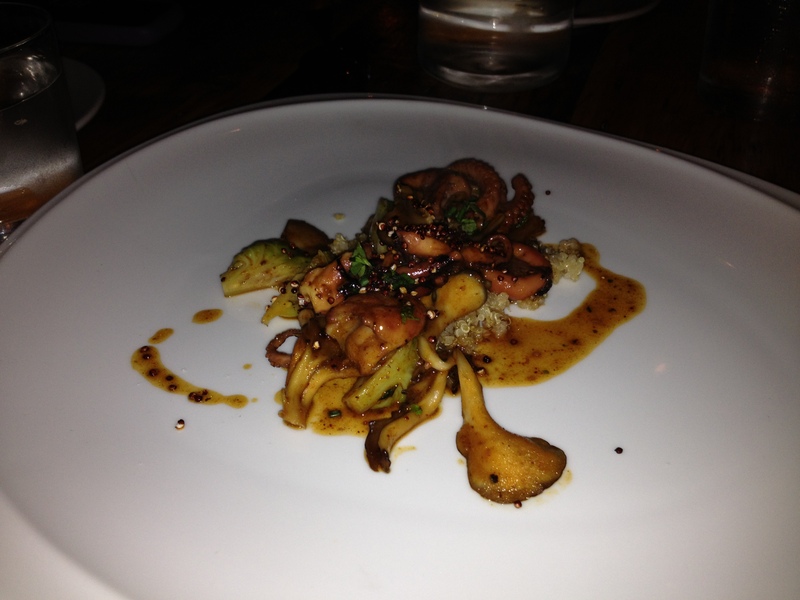 Finally, the octopus was soft and had a tender texture that went well with the mild flavor from the harissa, all on top of some quinoa that was cooked so it was no longer crunchy. 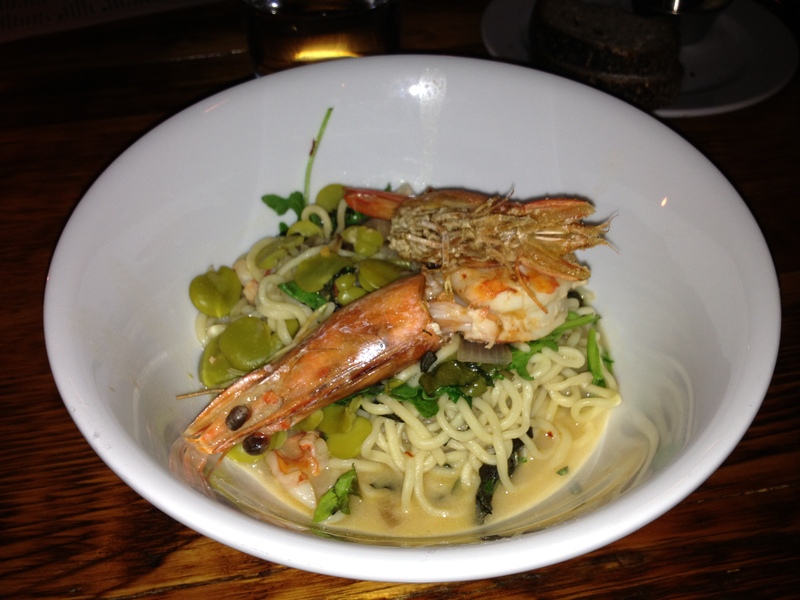 For our entrees, I ordered the noodles with head on prawns. The noodles were wavy medium thick noodles, like ones you’d order in a ramen shop. There was a nice initial spicy hint from some red chili flakes and a good salt seafood flavor from the prawns. In terms of portion, there was one whole prawn and bits of another hidden among the noodles. The prawns were big and meaty, almost like miniature lobsters. Some green vegetables also added a slightly bitter taste to the dish as well. Overall, it was decent. The other entrees at the table included the flounder and tilefish. Unfortunately, both were just ok. 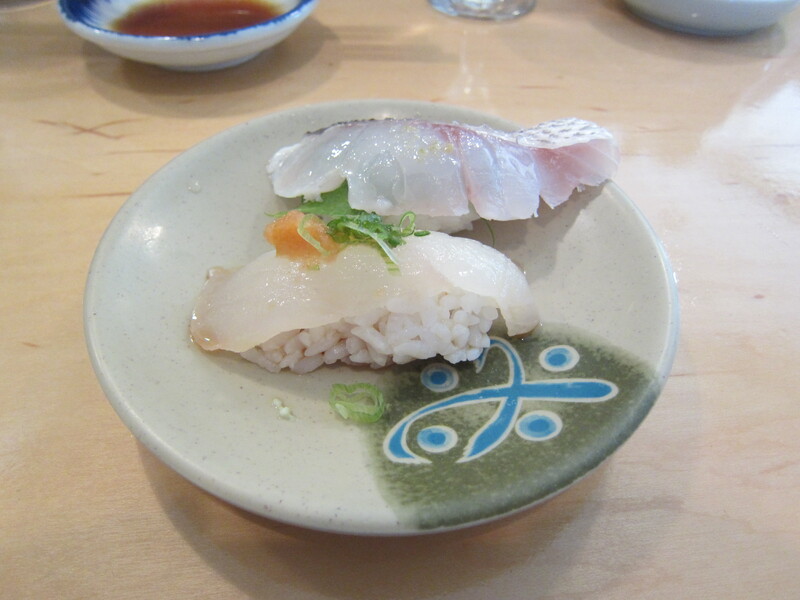 The fish were not the freshest, so they were somewhat bland and did not have much flavor by themselves. They were garnished and seasoned on the surface, but that did not compensate for the dishes as a whole. On the plus side, service was good. Decor is nice with a wood seafaring theme (even my interior designer friend approved of the lights and atmosphere). Although, I thought the ambiance didn’t quite fit with the asian inspired menu, or vice versa. The restaurant is not terribly big, which gives it a slightly intimate feeling. However, with the medium volume music and energetic crowd, expect to repeat a few sentences here and there. An interesting touch is that their wine menu includes characteristics of each wine, helping the customer choose the appropriate glass or bottle for the meal. It’s still early, so they do have some kinks to work out; but once they do, I believe this will be a nice addition to the area. On a lazy day off, I decided to wander into Tertulia and grab a simple bite for lunch. I noticed the nice and casual decor right away when I sat down at the bar. There was barely anybody around noon time, but started getting really busy around 1:30pm. As the bartender and I conversed about food and life, I could tell she was really knowledgeable about all the ingredients and dishes on the menu. In the end, I decided to order the croquettes (no-brainer) and brussels sprouts. 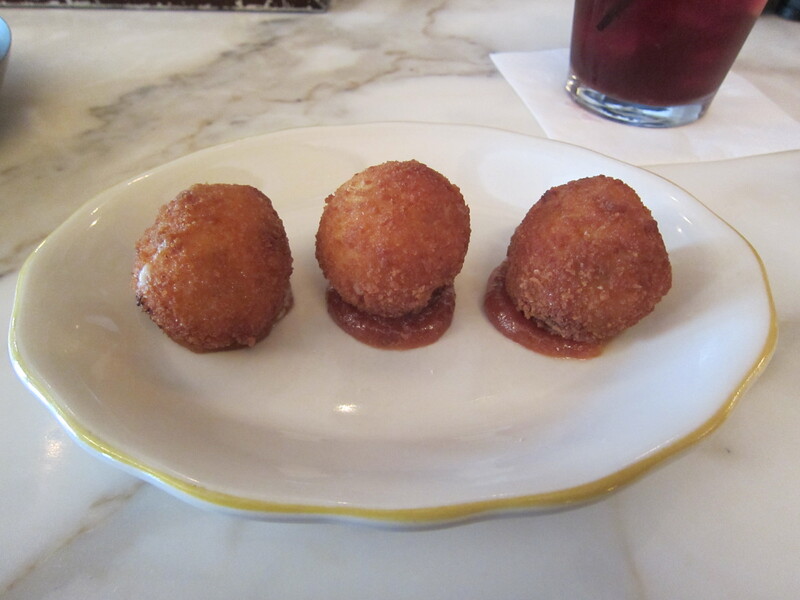 Ibérico ham croquettes, membrillo. Gently fried with a soft and creamy inside. The ham was tender and diced, but there was not a lot of it. They sat on top of some sweet membrillo that gave the dish some sweetness. Good dish, but I would’ve liked more ham flavor. Crispy brussels sprouts, pork belly, mojo picón. 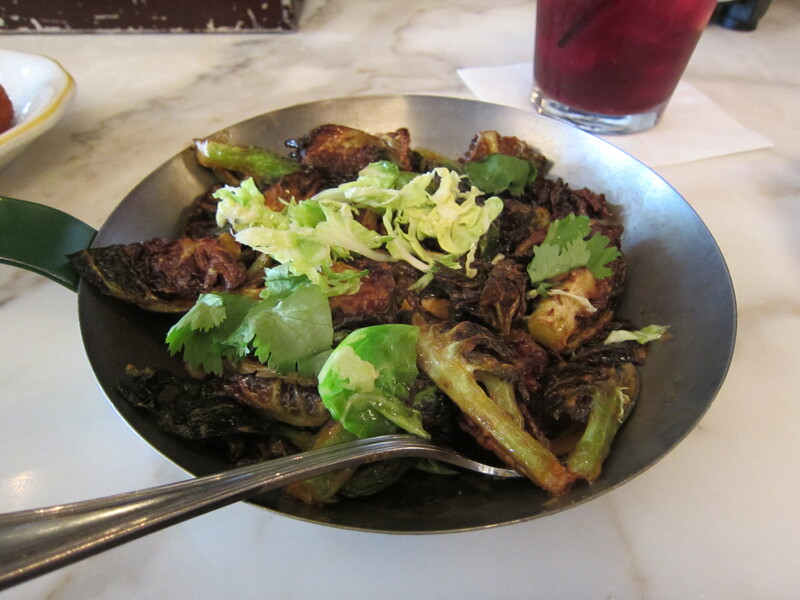 The brussels sprouts were tasty and cooked well with a slight char on them. Hiding in the forest of green were a few pieces of amazing pork belly that really added to the flavor of the dish when you had a bite of it. Again, I wished there was more pork belly. Still feeling hungry, I ordered the fried shishito peppers. 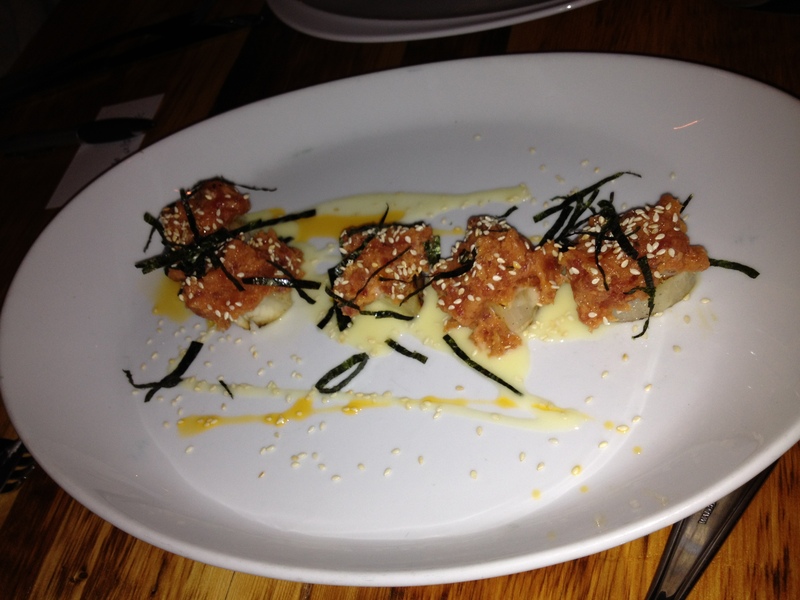 They were a nice casual finger food, and the sea salt definitely added both texture and taste to the dish. I expected more heat from the peppers, but since I don’t think they were completely in season yet, I was slightly disappointed. If you also fancy a drink here, I would recommend one of their special cocktails infused with their own housemade liquor. I tried their whiskey pear cocktail and it was delicious. 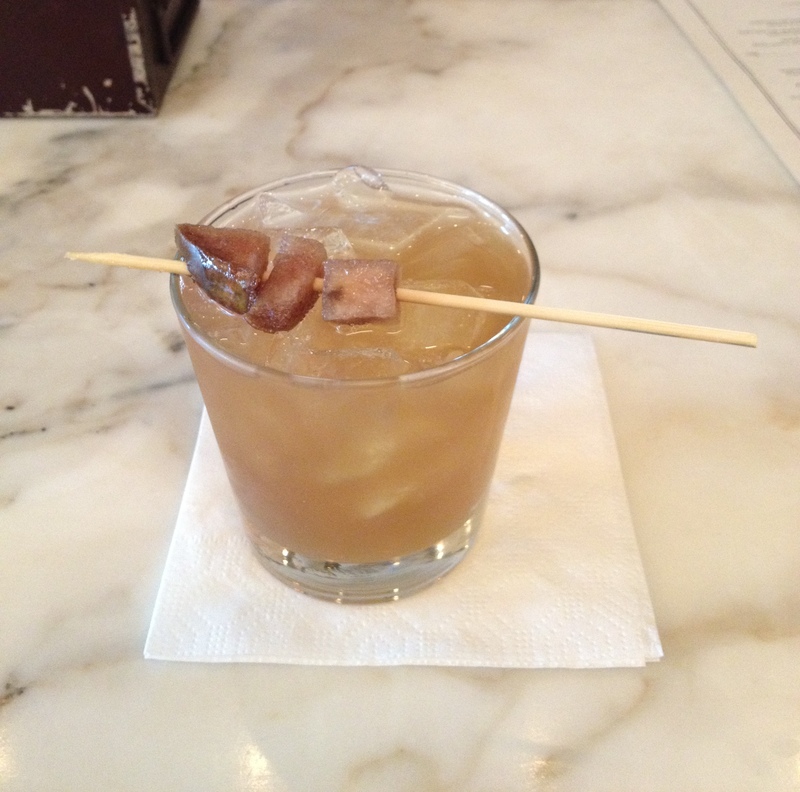 Topped with a really nice smoked pear skewer, the cocktail was not overpowered by the housemade pear syrup in the whiskey. The drink still retained the smokey flavor of both the pear and the whiskey. My friend and I came here on a last minute 4th of July decision. And what a great decision it was! They were having a special all-you-can-eat-and-drink hot dogs, burgers, bronx pale ale beer, and white wine for $30. The food was all made to order so it always came out hot and fresh. And don’t think they were lousy hot dogs or burgers either; the hot dogs were the exact same ones they serve regularly on their menu. The tasty all beef hot dogs were made in-house and had a great snap to their casing. The toppings of beef heart and beef chili with a sprinkle of white onions and mustard really elevated the hot dogs to another level. These were some of the best hot dogs that I’ve ever had. As for the burgers, they were cooked medium with your standard lettuce, tomato, onion, and ketchup. Solid, but not as delicious or creative as the “Cannibal Dogs” as they call them. 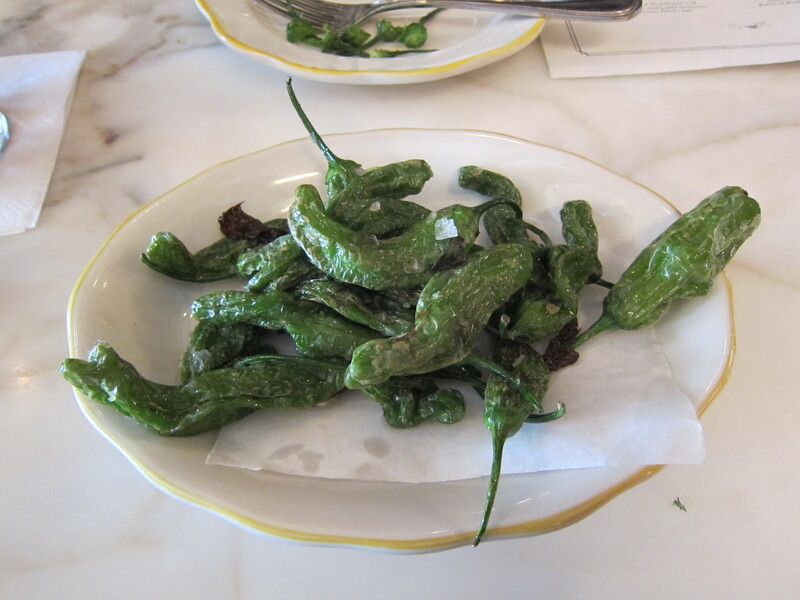 Impressed with the food, we decided to also order their merguez sausage, which did not disappoint either. The sausage was just spicy enough to give it a noticeable kick, while the other herbs and spices mixed in really added depth and flavor to the sausage. The tomato, eggplant, and chickpea sauce balanced out the sausage and provided a nice base to the overall dish. Cannibal, while small in terms of space, provides a very chill and casual atmosphere, whether you sit inside or out back where they have another seating area. They have an impressive selection of bottled beers that the knowledge staff can help you pick out depending on what you’re in the mood for. The only downside for me is that their portions are on the smaller side. This is an absolutely great place to have a drink and snack, but be prepared to spend a bit more if you’re hungry. I look forward to my next visit, as I’m already eyeing the braised pork belly, bone marrow, and slow roasted half pig’s head. Who’s in? Omakase at it’s best. That’s the best way of describing Sasabune. With no menu, you go by their “Trust Me” motto and eat whatever is served that day because, simply put, that’s the best. To go along with our meal, we ordered a dry sake with lots of floral notes. Delicious as well. 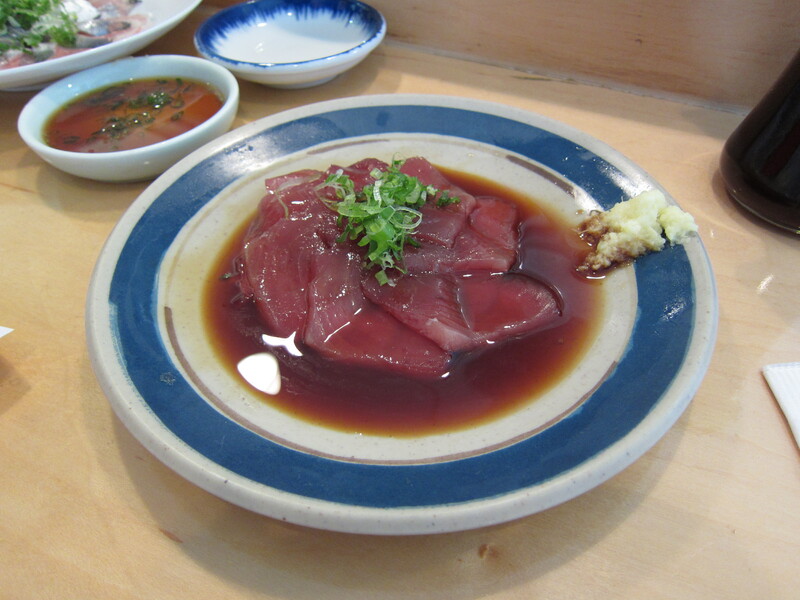 Overall, the meal at Sasabune alone was worth the trip to Los Angeles. I would be very interested in trying out the other Sasabune locations in Hawaii and New York to see how they match up against LA. It’s hard to say much about the sushi except that it was awesome, so I’ll just leave you with some pictures and comments. 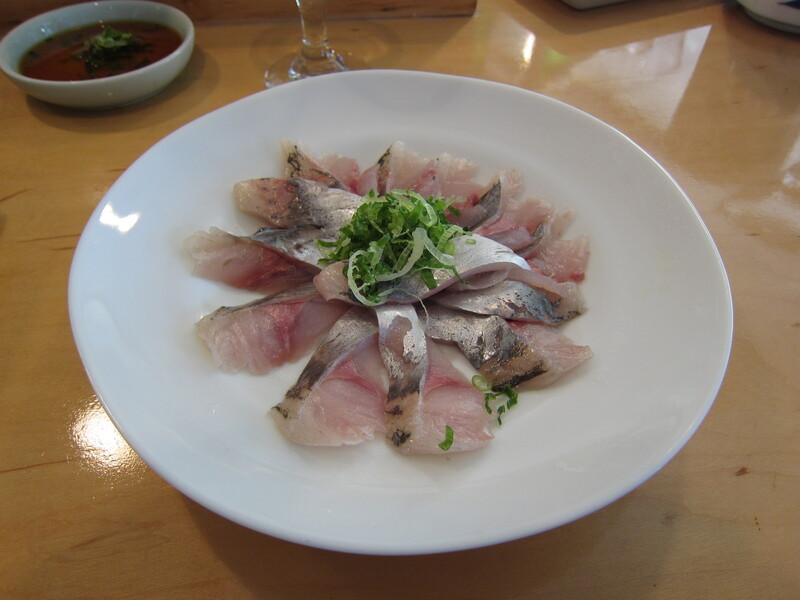 Spanish mackerel. 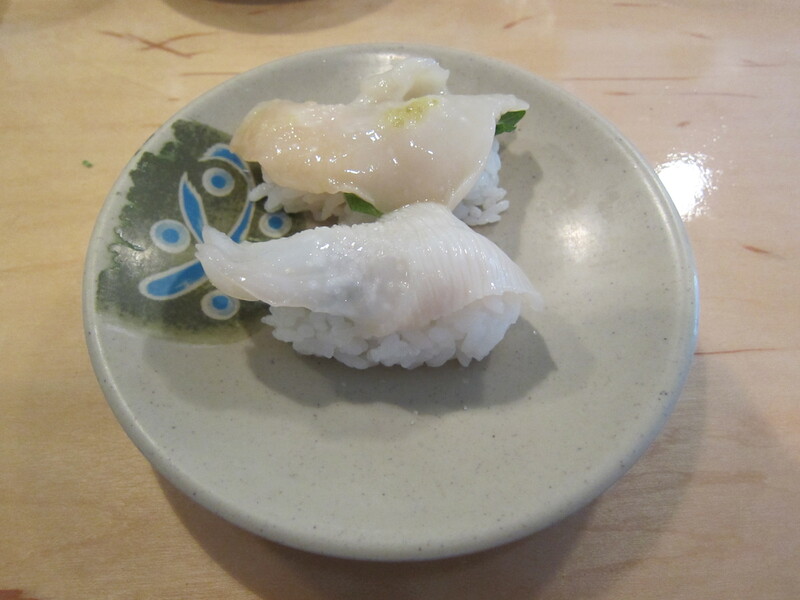 Each piece was tender and not at all fishy in taste. Pen shell clam. This was surprisingly not chewy and had more of a substantial bite and texture to it. 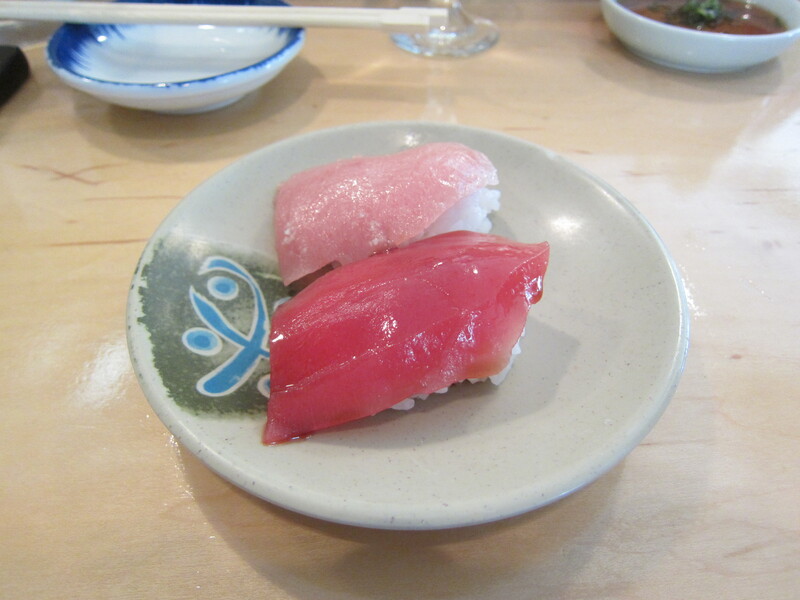 Tuna and toro (fatty tuna). These were super tender and even better with the warm rice. Halibut and New Zealand red snapper. No soy sauce on the halibut, but yes with the snapper. 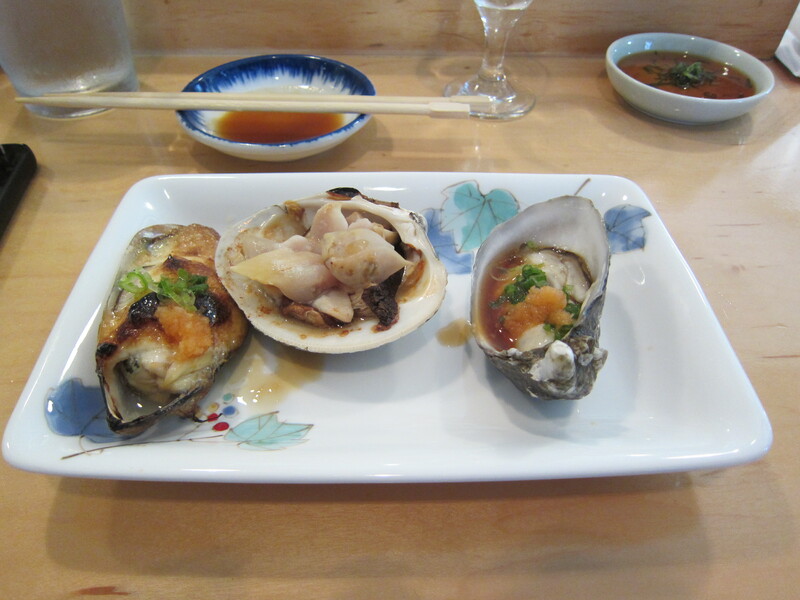 Oysters and clam: New Zealand (left), Cherrystone (middle), Shiraku (right). The New Zealand oyster was baked, the Cherrystone clam was paired with mushrooms , and the Japanese Shiraku had a really fresh texture to it that tasted just like you had just pulled it right out of the ocean. 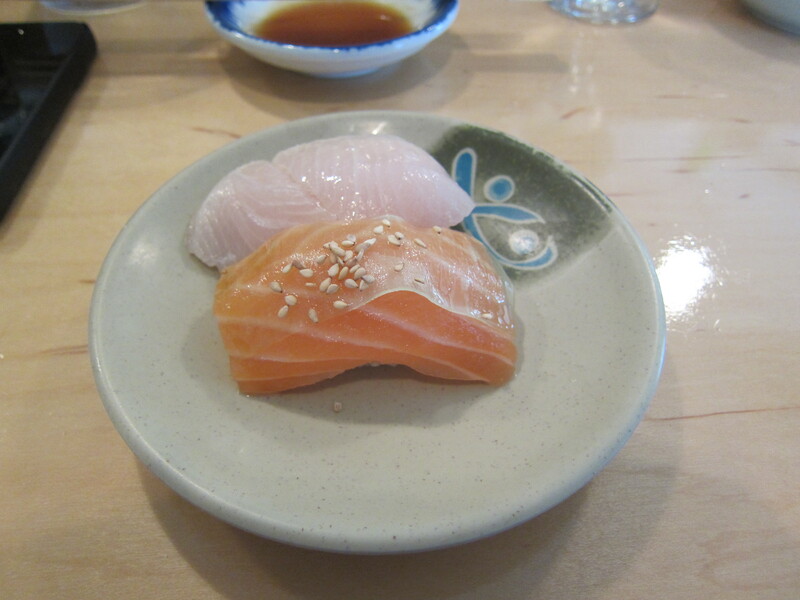 Japanese hamachi yellowtail and Scottish salmon. The hamachi had a little citrus twist to it. Smoked oyster and amaebi from Santa Barbara. No soy sauce for the oyster as it already had unagi sauce, which gave it a smokey sweet flavor. 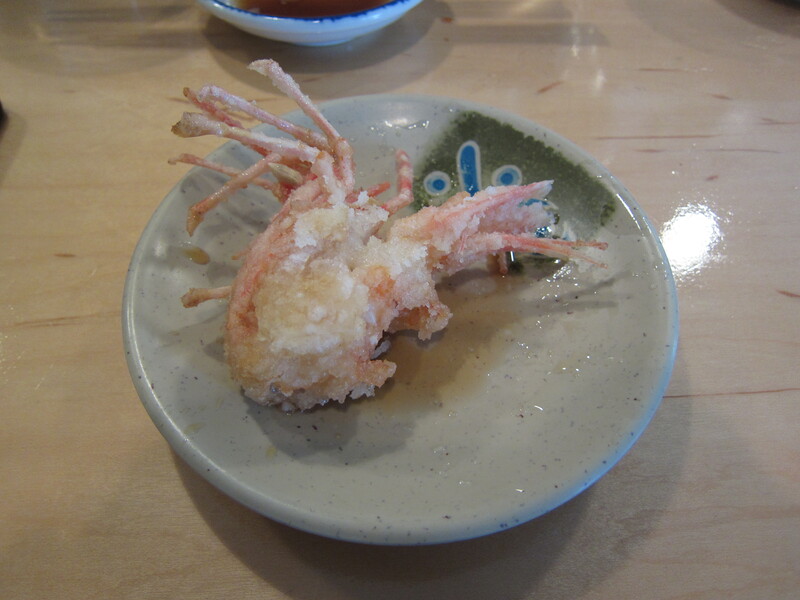 The amaebi (sweet shrimp) was the largest that I had ever come across. It was still creamy and buttery in taste, with an almost silky texture. Fried amaebi. Who doesn’t like fried shrimp?! Giant clam from Santa Barbara and orange clam from Boston. 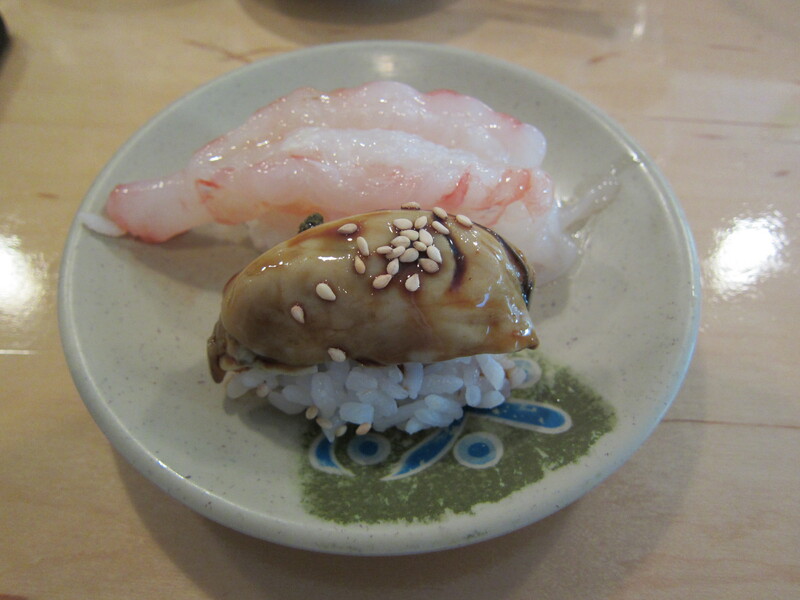 The giant clam had a stronger chewier texture to it, while the orange clam had a citrusy lemony garnish. Uni from the waters between San Diego and San Catalina and ikara. 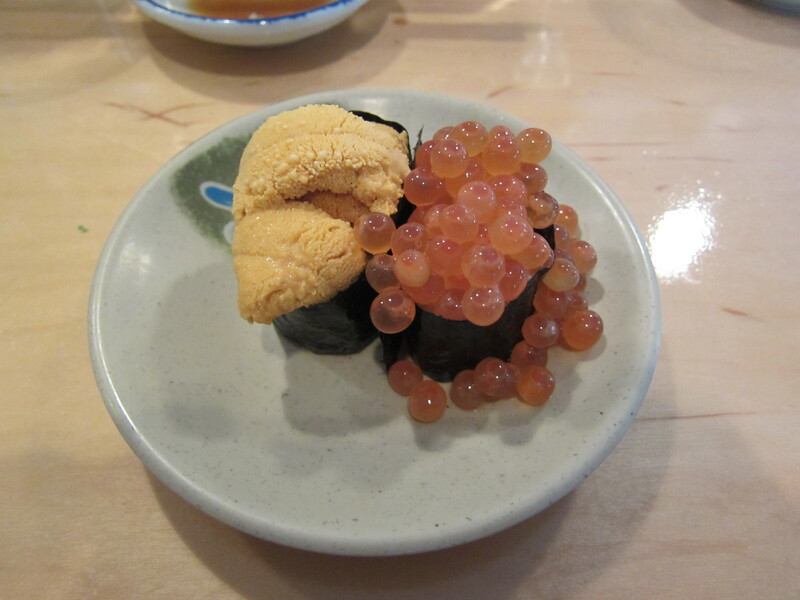 The uni was creamy and, no joke, just melted in your mouth it was so delicious and sweet. 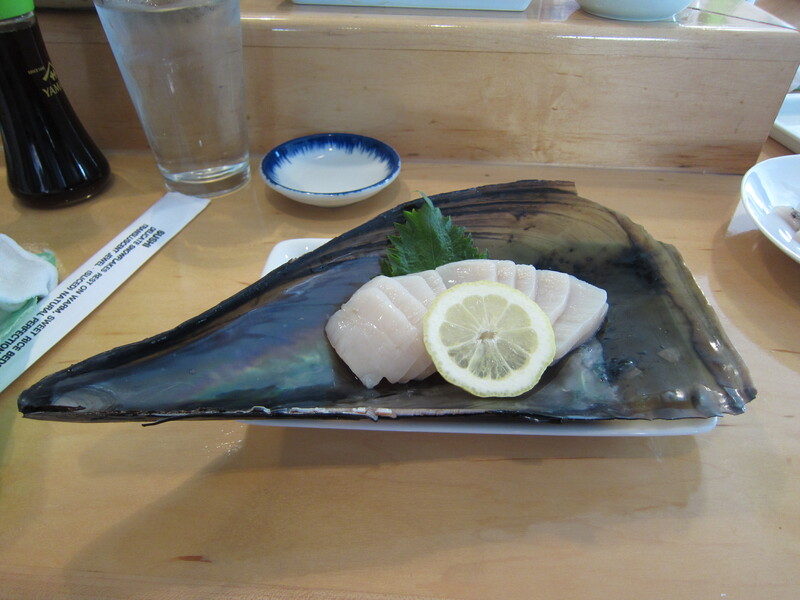 The ikara was fresh as mouthful burst with sweet and salty juices, not like the typical over-salty imitation ones. 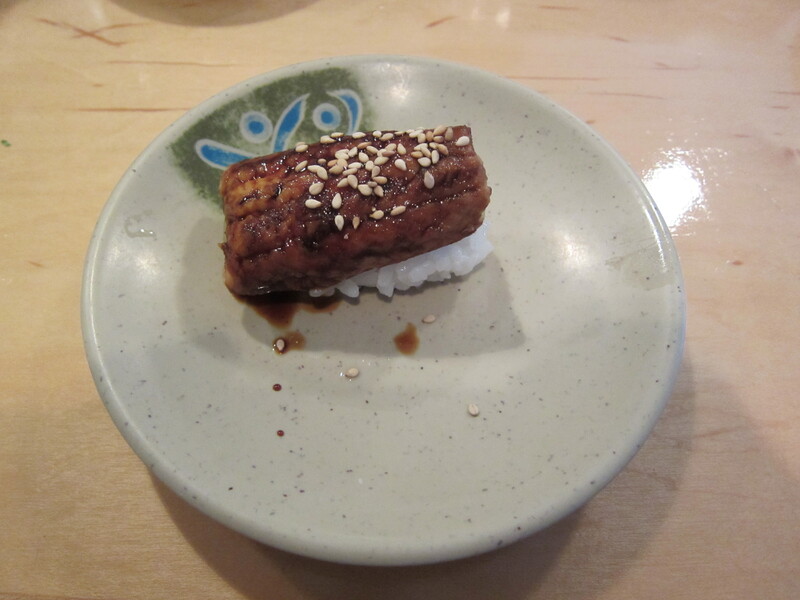 Unagi (eel) from Japan. The texture was so soft and warm that it was like a small bundle of joy sprinkled with sesame. Finally, a meaty and sweet blue crab roll. Step 3. Start eating some of the best and freshest sushi, personally handed directly to you by the chef, as he prepares your next dish right in front of you. 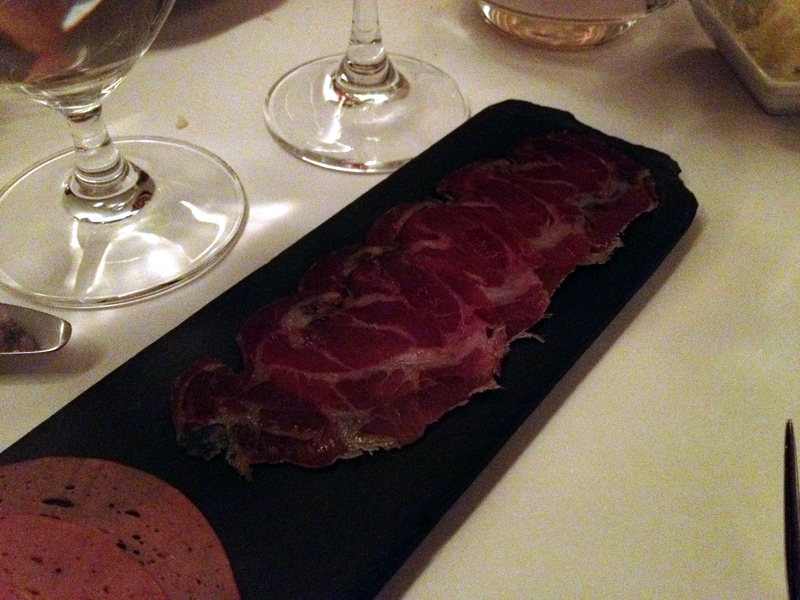 Blue Hill is truly a gem not only in Greenwich Village, but in all of New York City. 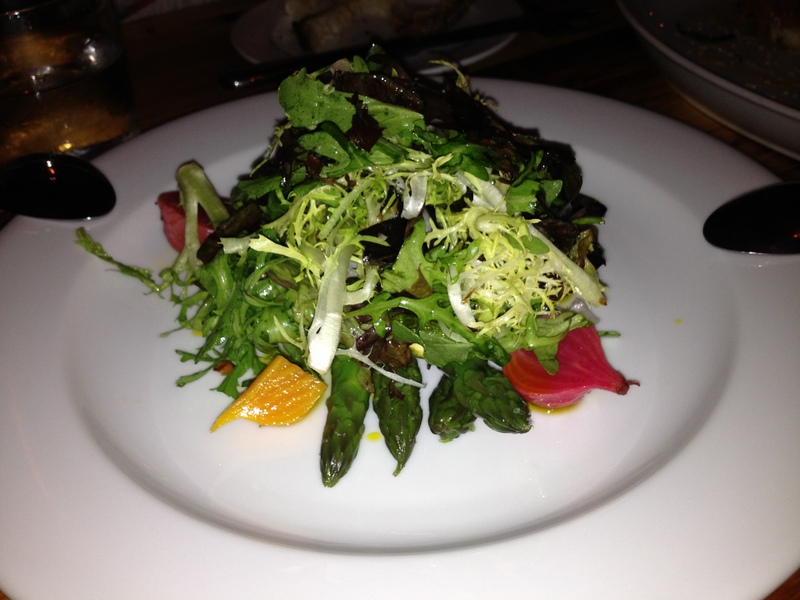 They exemplify the farm to table concept better than any other restaurant in the area, and for good reason. All ingredients are sourced fresh and locally so that diners can really experience and taste the difference. Inside the restaurant, you can also find a great atmosphere. It’s not very loud, so everyone can hear what’s being said at the table; but at the same time, you can hear the subtle background noise of other conversations, and they all seem to be saying one thing – how good the food is. Blue Hill gave me a great impression right off the bat. Our waitress was very attentive and knowledgeable about each and every detail pertaining to the menu. The bread they served was terrific. It was slightly warm with a crunchy thin crust on the outside and a small chew still on the inside. Our amuse bouches started with beat burgers garnished with caper leaves. Next, we had some lightly salted kale chips with a nice crispy texture that still retained a strong taste of kale. 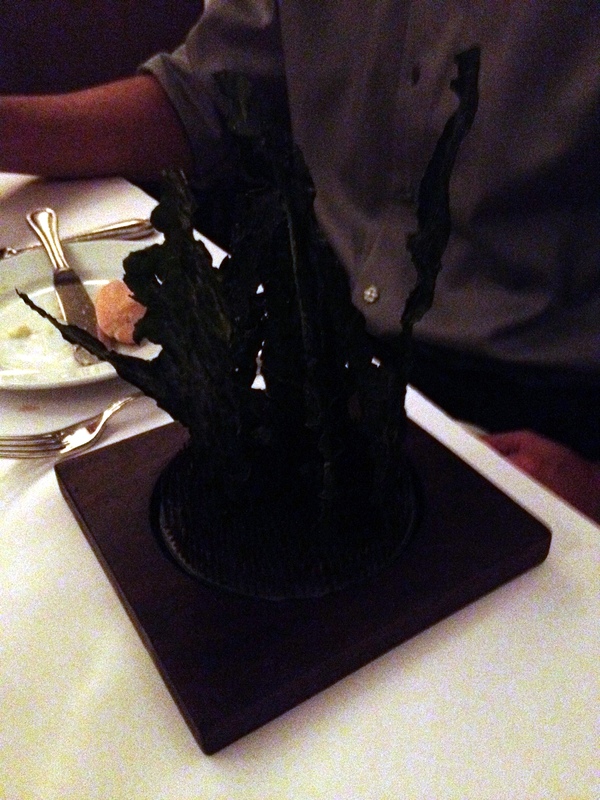 The presentation of the kale standing tall on a wooden slab was nice too. 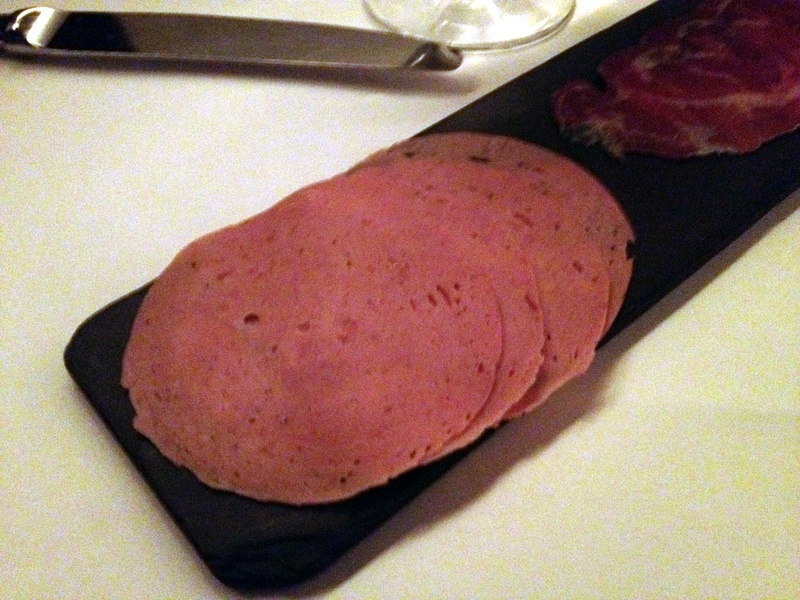 To finish off our amuse bouches, we had a small platter of charcuterie consisting of salami (first picture above) and pork shoulder coppa (second picture above). 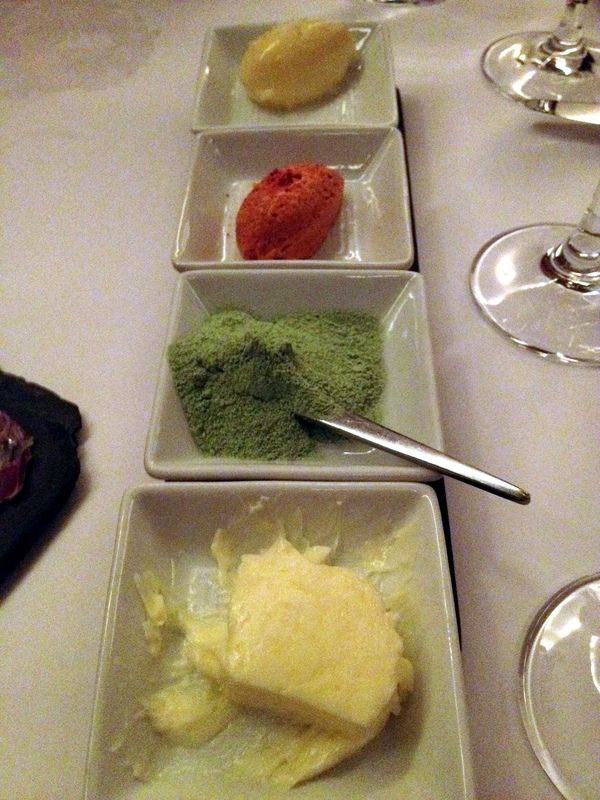 To accompany our bread and amuse bouches, we were also given special housemade butter (top), lardo (middle top), and fennel salt (middle bottom), in addition to the normal butter (bottom) served at the table. Our favorite was the really rich and flavorful lardo. For our first course, we had this morning’s poached farm egg with asparagus marmalade, bio char red onion and greenhouse greens. The egg was undeniably fresh in taste, as the yolk slowly oozed out of it’s egg white casing when cut into. On the lighter side, the dish was a nice start to the rest of the meal. 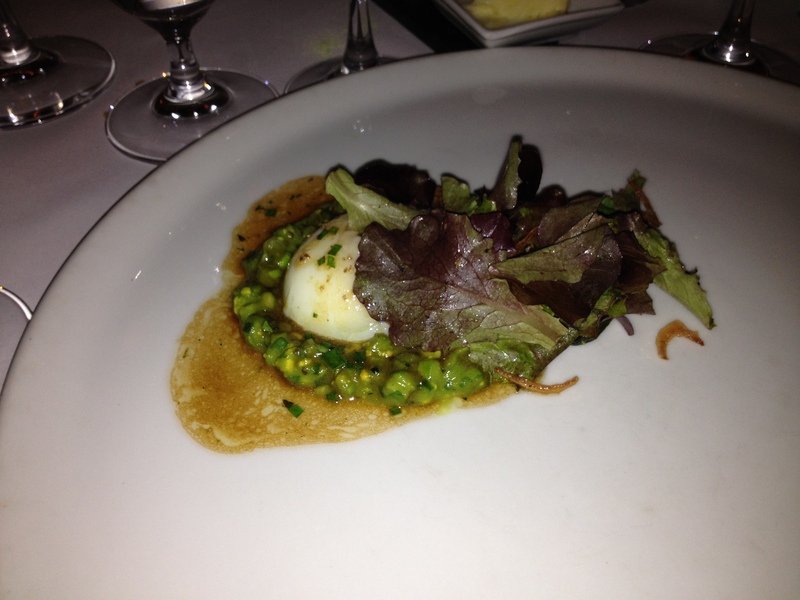 This course was paired with a crisp minerally wine from northern Italy. Next, the second course was a purple potato and ricotta gnocchi with shitake mushrooms, hazelnuts and stone barns coppa. 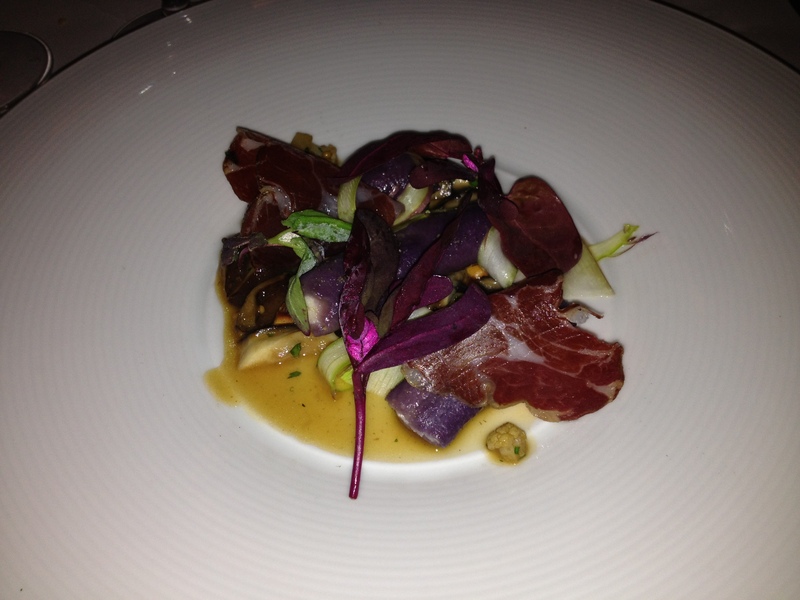 The colorful presentation really complimented the earthy and nutty taste of the dish. This was paired with a nice crisp white wine, also from Italy, that brought out the earthy notes even more. 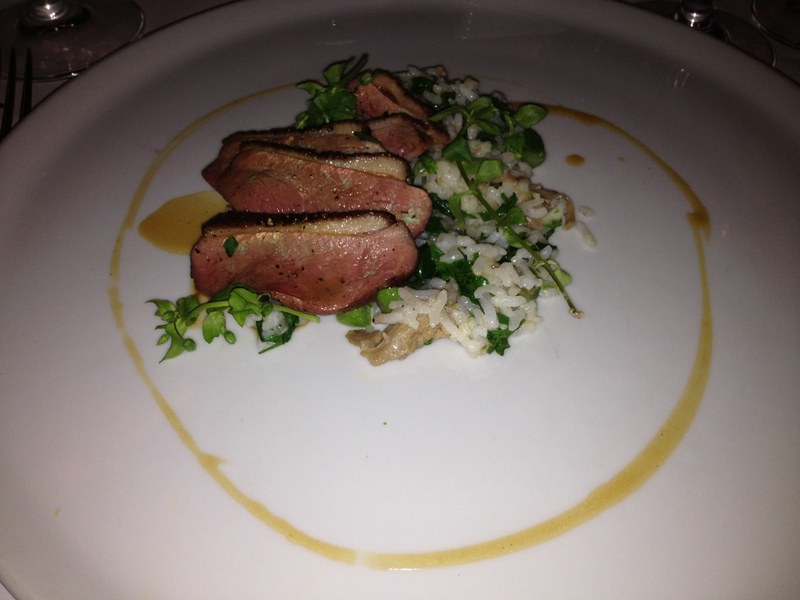 The third course was a Hudson Valley duck with Charleston gold rice, asparagus and lamb’s quarters. The duck was seasoned well and cooked perfectly so that each bite was tender and juicy. A medium-bodied red wine blend of Grenache and Syrah from France was paired perfectly with the duck. It brought all the components together well and had a great clean finish to top everything off. The fourth course was a strawberry and red wine soup with pink peppercorn sorbet. I wasn’t the biggest fan of the flavors in this dish, but the spiciness from the peppercorn really cut into everything else and stole the show, adding another interesting dimension. The fifth and last course was a steamed goat cheesecake with poached rhubarb and yogurt sorbet. Each deconstructed component of this dish was amazingly delicious. The soft creamy texture of the cheesecake married perfectly with the crunchy fresh granola. A sweet moscato from Italy balanced well with all the components of the dish. 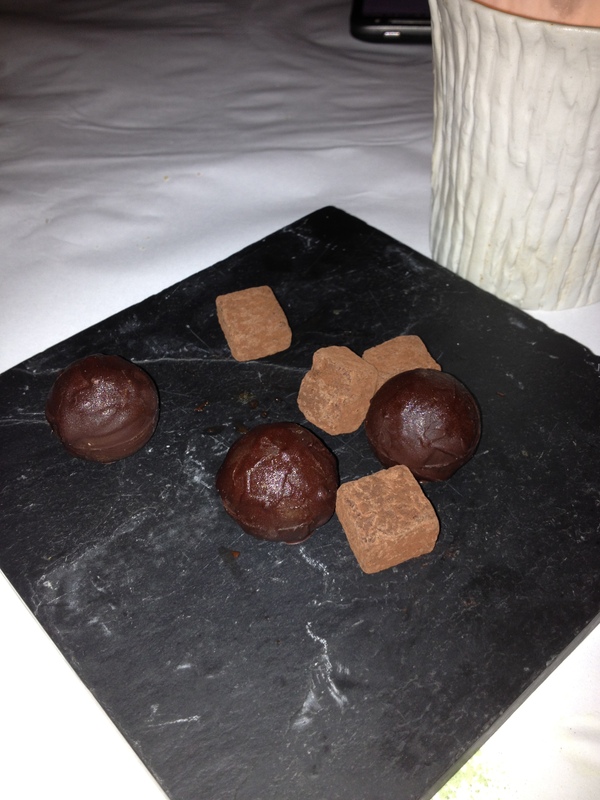 We finished our meal with a couple chocolate bites, a blood orange truffle and a honey chocolate. The truffle had a nice hint of orange flavor that balanced the chocolate. Needless to say, on the opposite side of the spectrum though, the honey chocolate was incredibly sweet. Overall, Blue Hill meets its expectations as one of the best restaurants in New York City and deserves its Michelin star award. Not only is all the food fresh and delicious, you can really feel the effort that goes into each plate, starting from the ingredients to the cooking and finally to the presentation. 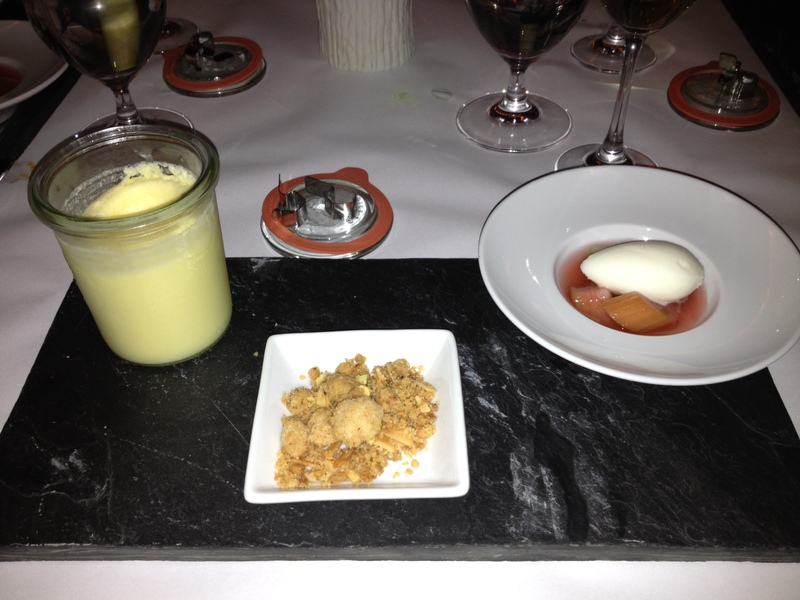 Service is excellent throughout the meal, making the dining experience even more enjoyable. I simply cannot wait for my next meal at Blue Hill, or maybe even Blue Hill at Stone Barns.